The 1950s began the introduction of the Rolex professional watch—those specific watches that were developed with a particular audience in mind and offered other functions beyond telling the time. The Submariner was developed for diving, the Explorer was built for tough expeditions, and the GMT-Master was intended for long haul flights. It is often argued that the current versions of those iconic collections are no longer tool watches since, for the most part, they are not used in the same way as they were over fifty years ago. Three Rolex watches suited for any occasion. However, whether owners of these watches choose to use them as a tool or a fashion statement is beside the point — these watches are still multipurpose instruments that can perform as they were intended to. In 1953, Rolex unveiled the first Submariner, which had the distinction of being the first watch waterproof to 100 meters (330 feet) deep. Its waterproofness, along with the ability to keep track of immersion time via the rotatable bezel, made the Submariner the quintessential diving watch of the era. 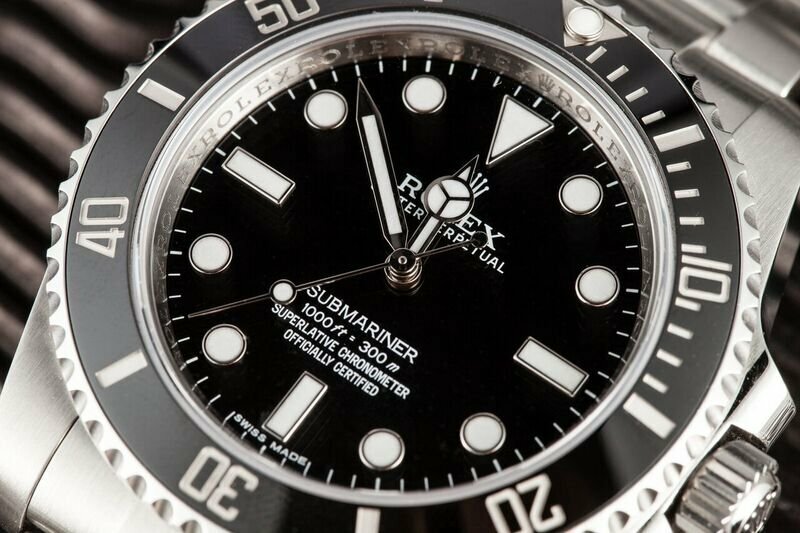 In 1953, Rolex unveiled the first Submariner. Today’s version of the Submariner no-date ref. 114060 retains many of the aesthetic fundamentals of the original, but it comes equipped with the brand’s latest features — the redesigned case 40mm Oyster, the unidirectional rotatable Cerachrom bezel with ceramic insert, the black Maxi dial with larger lume plots and hands, the stainless steel Oyster bracelet with Glidelock extension system, and of course, waterproofness of 300 meters (1,000 feet). Due to the lack of a date window, the no-date version of the Submariner is especially prized for its symmetry. 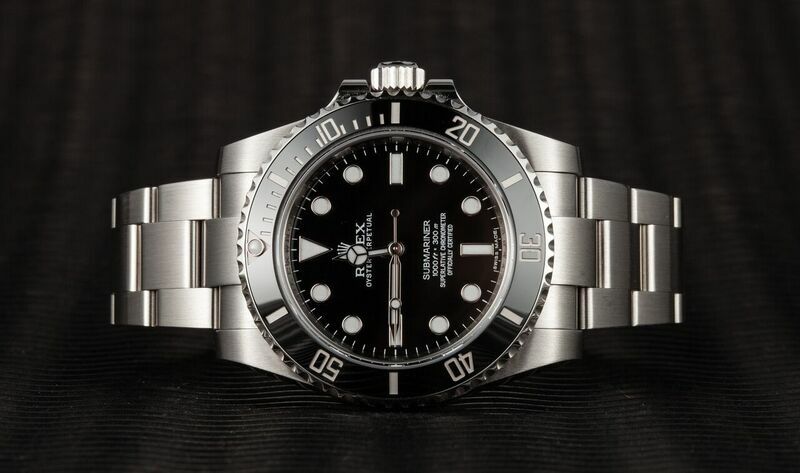 Rolex Submariner 114060 has a unidirectional rotatable Cerachrom bezel. Two years after Rolex introduced a watch for underwater exploration, they launched one to fly through the skies. The GMT-Master was born in 1955 thanks to their collaboration with Pan Am. 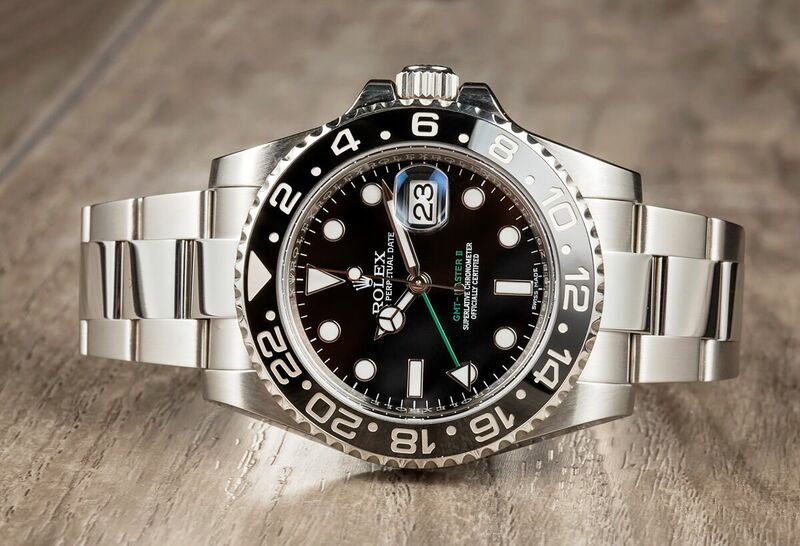 The airline needed to equip their pilots with a watch that could track both home and local time while they were flying to different time zones and Rolex developed the GMT-Master with its rotatable two-tone bezel and extra hour hand. GMT-Master II ref. 116710LN is the pilot’s first choice from Rolex. Fifty years later, in 2005, the Swiss watchmaker presented the GMT-Master II ref. 116710 with a host of new features—most notably replacing the aluminum bezel with a ceramic insert, which is prized for its resistance to scratching and fading. The combination of the black bezel, black dial, and green 24-hour hand is especially striking. The choice of stainless steel on both the 40mm Oyster case and Oyster bracelet adds toughness to the watch while the date window and ability to track three time zones adds practicality. In 1971, Rolex revealed the Explorer II as a more modern interpretation of the original 1950s Explorer model. Positioned as a watch that was robust enough to handle the expeditions of even the most extreme adventurers, the Explorer II offers some very practical functions including great legibility, extra 24-hour hand to differentiate between day and night, date window, and waterproofness to 100m. 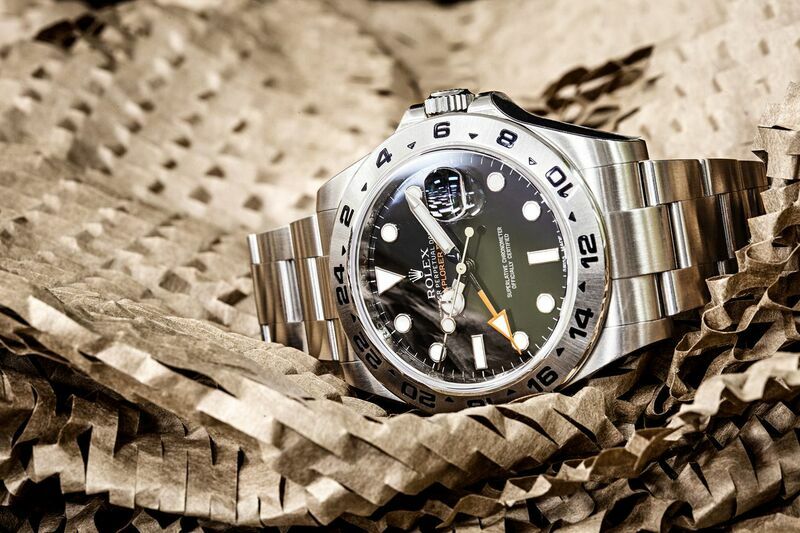 Made for those with a heart of adventure, the Explorer truly carries the spirit of Rolex. 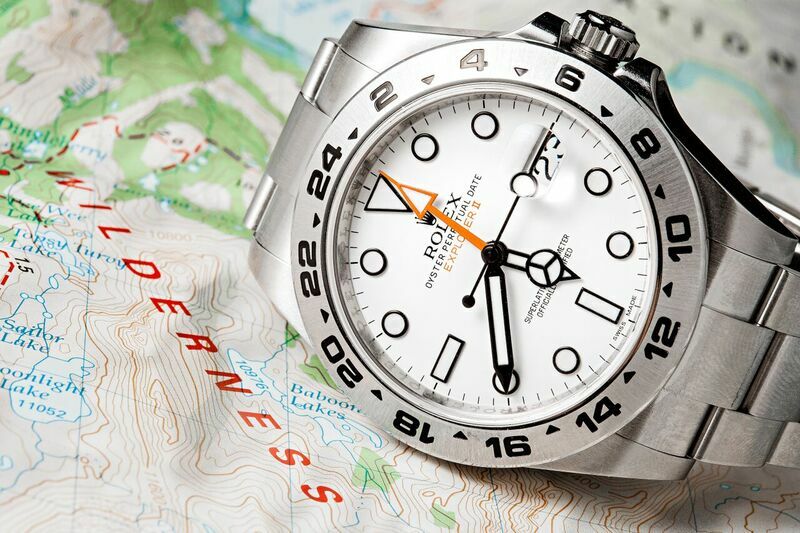 In 2011, the Explorer II was revamped by Rolex to include a larger Oyster case at 42mm, larger hands and luminescent hour markers and a larger 24-hour orange arrow-tipped hand. The ref. 216570 is offered with either a white dial or black dial. 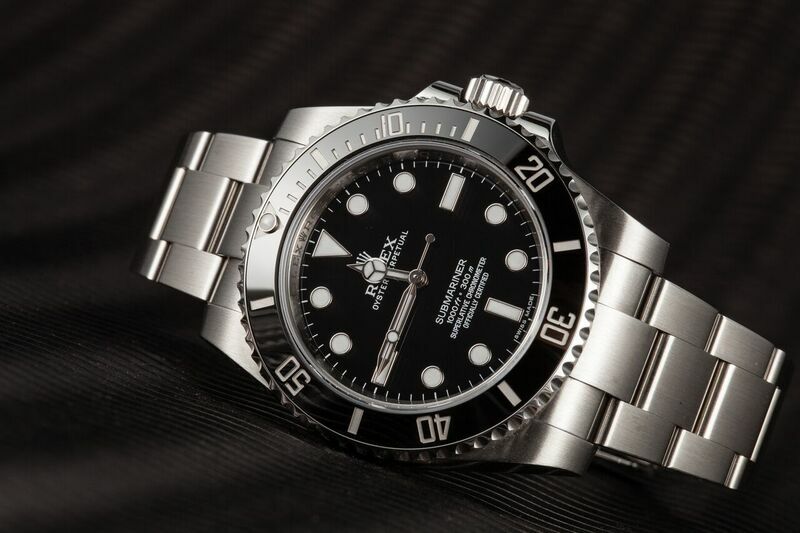 In 2011, the Explorer II was revamped by Rolex to include a larger Oyster case at 42mm.